Michelle Akers likes to say how she can be oblivious to the obvious. Being a key part of the U.S. Women’s National Teams that won two FIFA Women’s World Cup championships in 1991 and 1999, and an Olympic gold medal in 1996. Finishing her playing career with 105 goals, 36 assists and 153 national team caps. Those are just a few accomplishments from an illustrious playing career. But something she’s never been oblivious to is the plight of suffering animals, and, in particular, horses. She started the non-profit Michelle Akers Horse Rescue & Outreach, Inc. in 2008 after taking in Zoe, a starved horse found in Sanford, Florida. After learning of other horses in need of rescue, Akers got to work and made an intuitive connection with the horses she began bringing in, having helped tend to or find better homes for 40 to 50 of them since 2008. She recalled taking in a stallion in horrible shape, and after three days, creating a “sacred bond” with him. “Even though it was heartbreaking and I cried for days thinking about it, it was super-empowering and rewarding to take care of him in the best way I could,” Akers said. Besides her passion for rescuing horses, she still has a burning passion for soccer. For the last year, she has been using the two small fields she had built on her eight-acre farm to train girls soccer players, even getting them involved with her horse rescue work. “I’m a cowgirl out on the field training the soccer kids,” Akers said, noting that sometimes, training is interrupted when the occasional pygmy goat scampers about. The horses are just across the fence. She wants the next generation to burn with the same passion that fueled her career and be a part of restoring the fear opponents have had for the U.S. Women’s National Team. As part of her oblivious nature, she said she wasn’t sure what reception she would receive after she decided to return to her soccer roots. She reached out to one of her good friends in the sport, Louise Waxler, who has been involved in the Washington, D.C.-area soccer scene for more than 25 years in various capacities. That led to Akers speaking at the recent NSCAA Women’s Soccer Breakfast in Indianapolis. Laughing and crying during her talk, she shared memories of the special people and events of her career–all without notes–and expressed her desire to reassert the fire in the game with which she played. Needless to say, she was welcomed back to the sport with open arms, and was overwhelmed and overjoyed with the reception she received. She said she is excited for the potential of the new National Women’s Soccer League to reassert U.S. dominance in women’s soccer. This is where the Washington Spirit owner Bill Lynch also got involved in helping, as he shares a passion for caring for animals in need as well as understands the historical contributions Akers has made and wants her to be a role model for the next generation. But just as that fire still burns within Akers for soccer, and the will to want to instill that in others, it burns just as bright for the important work she is doing rescuing emaciated horses. She wants to do more, but she has limited capacity on her farm, located just outside Atlanta. Her biggest need at this point is money. She’d like to be able to buy more hay, resources to house the horses, and resources for others like her who are involved in rescuing horses. She is also always on the lookout for committed volunteers. And while her work rescuing horses has been more difficult than she could imagine, she says she is healed and blessed everyday through the people and horses she encounters. “It is an awesome feeling to walk into my barn each morning and see the happy and healthy faces of those who were not long ago suffering in silence,” she writes on her website. “My goal, because the soccer community is so large, and I see how big-hearted the soccer community is, is to connect nationally and have a people-resource, which in turn brings financial and material resources and manpower to places like mine to rescue or take care of sick animals so they have more support,” Akers said. In the meantime, Akers has fences to paint and horses to tend to on the farm, and horses to find homes for. She enjoyed her soccer playing days, and is excited to be involved in the sport again, but she also has important work to accomplish in making sure neglected horses get rescued. And like her playing career, she burns with a desire to help in any way she can. And it’s that desire that fuels her. 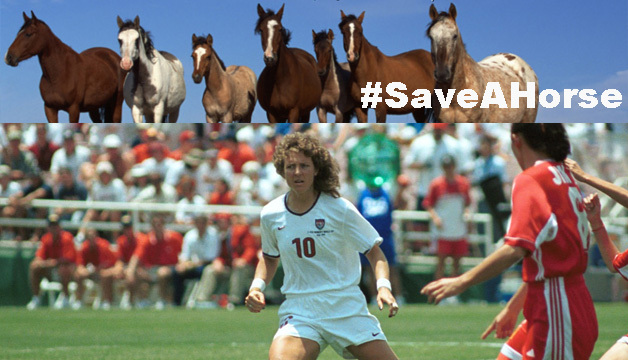 1) Donate directly at http://www.michelleakershorserescue.org, then tweet @washspirit and @michelleakers10 using #SaveAHorse and the amount you donated in a 2nd hashtag like #25 for $25. We’ll RT a thank you with a running total of the amount raised so far. 2) Follow @washspirit on Twitter (and tell your friends). When we hit 10,000 total Twitter followers, we’ll donate $2,500 directly to Michelle’s horse rescue ourselves!